I give thanks to my God always for you because of the grace of God that was given you in Christ Jesus, that in every way you were enriched in him in all speech and all knowledge — even as the testimony about Christ was confirmed among you — so that you are not lacking in any gift, as you wait for the revealing of our Lord Jesus Christ, who will sustain you to the end, guiltless in the day of our Lord Jesus Christ. During Paul's second journey, he established a church at Corinth, an important city in southern Greece. (Acts 18:1-17) On his third journey, he got reports of difficulties with the new Christian community. Much of the trouble came from members identifying themselves with different religious leaders. 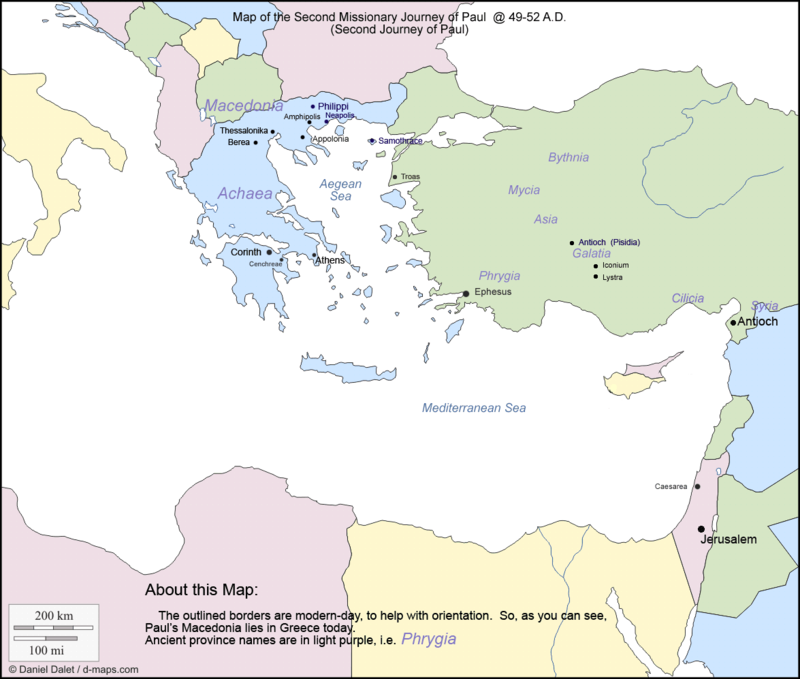 There were also a wide variety of viewpoints, some of them extreme, about how the churches should be run, leadership, and Christian lifestyle, for the great majority of the church in Corinth were Gentiles and the background of Jewish morality that informed Jewish churches did not come naturally to many of them. In fact, in this respect, the attitudes of metropolitan Greeks 2000 years ago were similar to modern secular attitudes. It was an individualistic society where philosophy and science were prominent, and self-fulfillment -- the purpose of one's life and how to best live -- were the subject of much philosophical discussion. Paul's First Epistle to the Corinthians, written during his long stay in Ephesus during his third journey, is one of the most quoted books in the Bible. It is full of practical advice as well as teachings on strictly theological issues and contains several of his most powerful, beautiful writing. In the opening verses, he mentions Sosthenes, which is a bit of a mystery. The former leader of the synagogue in Corinth, who had been instrumental in the founding of the church and had suffered violence, might have been traveling with Paul, and if so, it would be natural for Paul to send the letter in Sosthenes' name as well as his own. Or it might have been some unknown Greek with good writing skills, acting as Paul's secretary. As usual, the letter begins with praise and thanks, reminding the Corinthians of their common great purpose. Paul starts, in other words, by building a sense of bond and kinship with the readers, reminding them of the love he has for them and assuring them that his only motivation is that all good things may come to them. 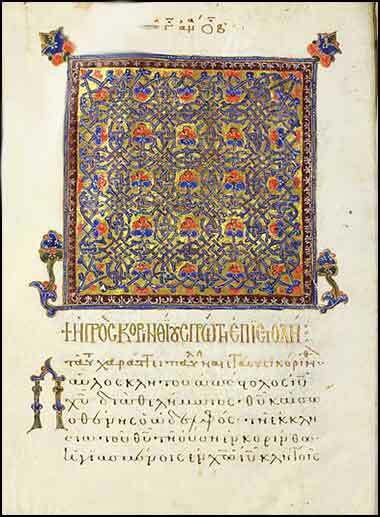 The beginning of 1 Corinthians from a 14th century Greek miniscule manuscript, penned by "Antonius, a monk".